The problem: You have a series of photos where the time is offset from the correct time but is still correct in relation to each other. Changing the battery on my camera switched to a default date. I wanted to synchronize the time on my camera to a GPS track so the photos matched the timestamped coordinates. At a family event where images from different cameras were added together. 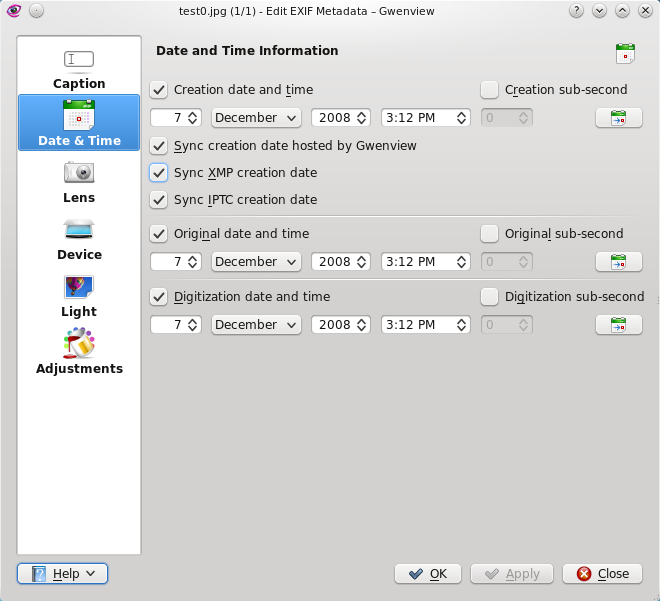 You can do edit the timestamp using a GUI and many photo manipulation applications like the GIMP support metadata editing. The problem is that this gets tiresome after a few images, and anyway the times are correct in relation to each other – I just need to add or subtract a time correction to them en masse. The answer: exiv2 – Image metadata manipulation tool. 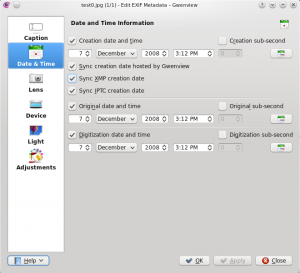 It is a program to read and write Exif, IPTC and XMP image metadata and image comments. Time adjustment in the format [-]HH[:MM[:SS]]. When we run this we can see that the timestamp has now changed. That’s it. Remember this is the end of the conversation – to give feedback you can either record a show for the HPR network and email it to admin@hackerpublicradio.org or write it on a post-it note and attach it to the windscreen of Dave Yates’s car as he’s recording his next show. This entry was posted in Podcasts and tagged Hacker Public Radio, hpr, multimedia. Bookmark the permalink. One Response to HPR: Shot of Hack – Changing the time offset of a series of photos. We all love cli. But maybe mapivi, http://mapivi.sourceforge.net/mapivi.shtml, could be the gui tool for the task.